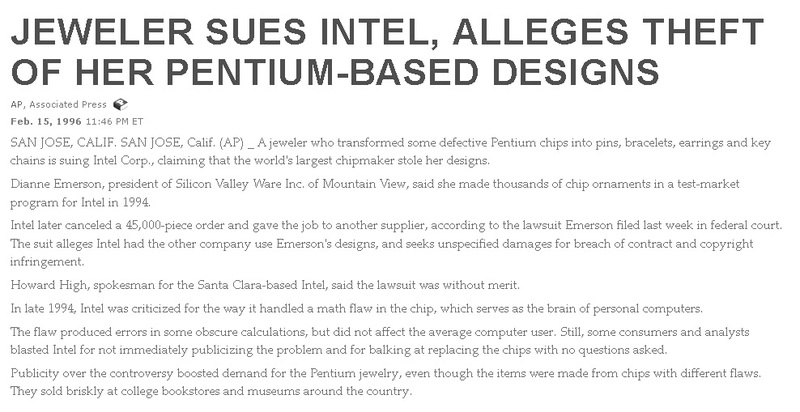 During the normal manufacture of Intel's Pentium chips, some flawed chips would inevitably be found during testing and typically Intel had no other choice but to destroy them since they would not meet quality standards that allowed them to be sold to consumers. In Fall 1994, Good Pentium chips were selling for $383 to OEM computer makers, but defective chips were strictly a costly waste to Intel. 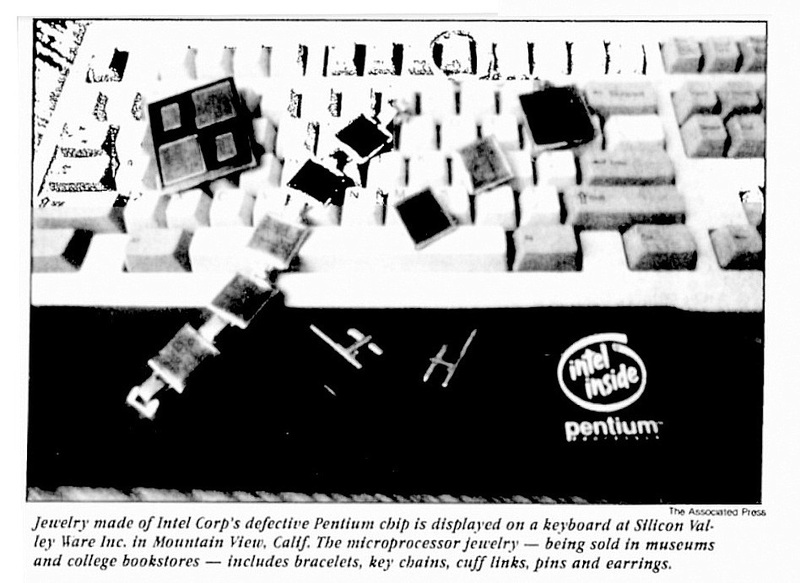 But in December 1994, Intel had a brilliant idea, they would transform the defective Pentium chips into unique promotional jewelry items including earrings, pins, link bracelets, cuff links, and even Pentium keychains. This would help recover some of the cost of lost revenue from the defective chips and at the same time offer a new avenue for promoting their new Pentium processor chips to the general public. In 1994, Intel solicited a local custom promotional product company called Silicon Valley Ware Inc. of mountain view ca. to design, market and manufacture the promotional chip items. Back in 1992 Silicon Valley Ware Inc. had previously made jewelry for Intel from some of their defective 486 processor chips that Intel wanted to give to it's employees and business contacts. 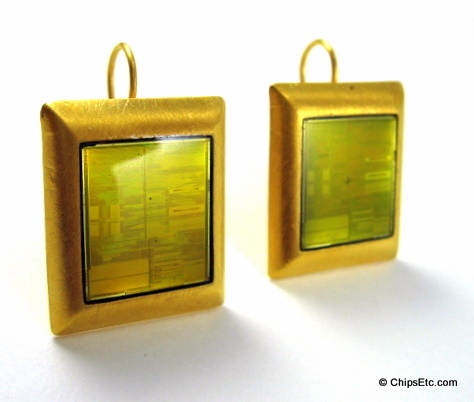 This time around Intel wanted to offer it's new Pentium chip jewelry to the consumer market as well. 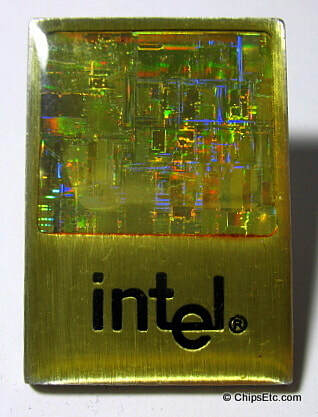 Intel supplied Silicon Valley Ware Inc. with the defective Pentium chips who then set them into their gold plated jewelry designs and finished the items by covering the chips with a clear epoxy layer to give them a gem like finish. These chips were normal production losses - not the Pentium chips which were afflicted with Intel's famous FDIV flaw in 1994. The publicity of the Pentium FDIV flaw later in the same year did help with creating additional interest in these Penitum chip items. 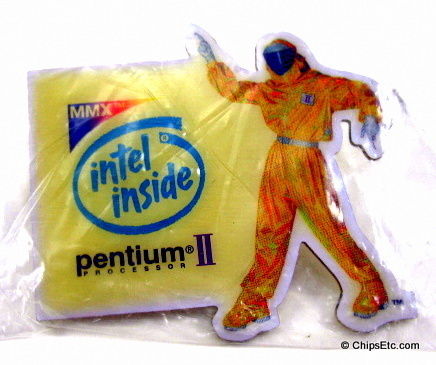 (There were some limited edition keychains made a year later with some of the actual Pentium FDIV flawed chips but they were made exclusively for Intel employees and business contacts only). 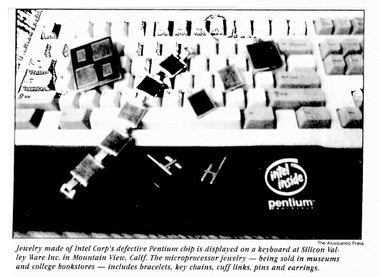 These Pentium promotional items were first offered for sale as a retail test program at 20 university bookstores and museums throughout the United States starting in August 1994. Harvard, Columbia, Brown & Standford University all offered the items at their campus bookstores. The Boston Computer Museum and the Smithsonian Institution also offered the items for sale to visitors in their gift stores. Each store had received an average of about 120 items to sell - The items quickly sold out as customers took to the amazing beauty of the Pentium chip's colors, sparkle, and beauty. 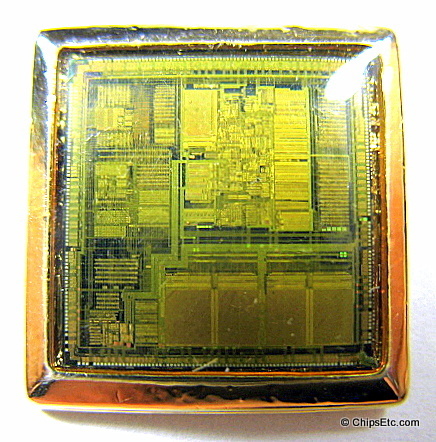 The Pentium chip had quickly become fashionable and quite a conversation piece. Earrings $25, Cufflinks $20, Link Bracelets $25, Lapel Pins $10, & Keychains $10. 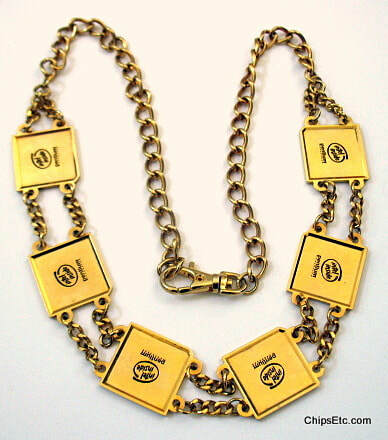 By the December 1994 Silicon Valley Ware Inc. had created an additional inventory of 12,000 pieces of Intel Pentium chip jewelry for the retail program, of those 10,000 of the items were the popular Pentium gold plated keychains. Intel had hopes that eventually the items would be popular enough to be sold in department stores but that level of sales was never reached. 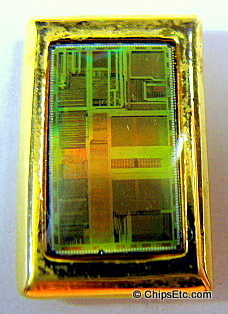 By 1996 Intel had moved on from the original Pentium jewelry retail test market with Silicon Valley Ware Inc., but for years to come they would still have many different styles of jewelry & keychains created for them by various other suppliers (using either metal or acrylic materials) that made use of their defective computer chips, showcasing such famous Intel chips as the Pentium, Pentium II, Pentium 3, Pentium 4 and others. Intel chip Jewelry items were offered to their employees though the IntelStore gift catalogs and at company stores located on select Intel campuses. 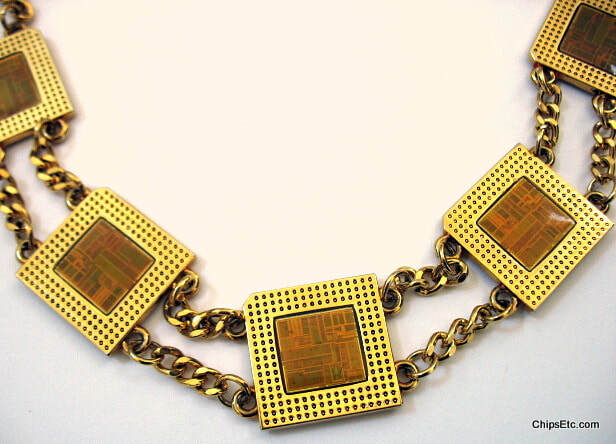 ​In 2014, Intel would once again enter the jewelry business but this time their jewelry was smart & fashionable. Intel's MICA (My Intelligent Communication Accessory) wearable smart bracelet was a collaboration with fashion label Opening Ceremony. MICA was created for fashion conscious ladies who also needed to monitor their social media feeds and calendar reminders. The luxurious 18k Gold plated MICA featured a 1.6" curved sapphire color touchscreen display, AT&T mobile 3G communications with SMS text capabilities, and could be charged wirelessly or thru a USB cable. The $500 MICA smart bracelets were offered with water-snake skin, Russian obsidian, Chinese pearls, lapis gemstones from Madagascar, and South African tiger's eye. Also in 2014, Intel would purchase wearable device leader Basis Science, Inc. for $100M. BASIS specialized in wearable device technology for health and wellness applications. Their BASIS Peak model was a popular fitness tracker watch that competed in the growing wearable device market with Fitbit, Misfit, Garmin and others. On August 03, 2016 Intel voluntarily issued a full recall of all Basis Peak smart watches due to risk of overheating. 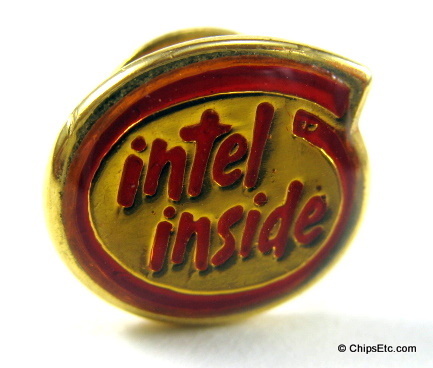 This tie tack is the earliest Intel promotional item in our collection that contains an example of one of their chips. It features an actual Intel 8086 processor which dates back to a time when Intel was only 10 years old and had only 10,000 employees. The 16-bit Intel 8086 chip was the very first x86 Microprocessor and was designed by Intel Engineer Stephen Morse to counter the growing threat from Zilog's Z80 microprocessor. The 8086 had 29,000 transistors and was manufactured using Intel's 3µ HMOS technology and had a clock speed of 5 MHz. The Intel 8086 would be used inside the first space shuttle as it roared into space in 1981, a mission critical processor chip used in NASA's diagnostic equipment that monitored the shuttle's twin booster rockets at launch. ​A year after the 8086's introduction, Intel would release the 8088 microprocessor which was a modified version of the 8086. The 8088 used the same microcode as the 8086 but divided up its external data bus in order to support earlier 8-bit systems & software such as Microsoft's BASIC. The Intel 8088 would revolutionize the home pc market a few years later thanks to the original IBM PC model 5150. 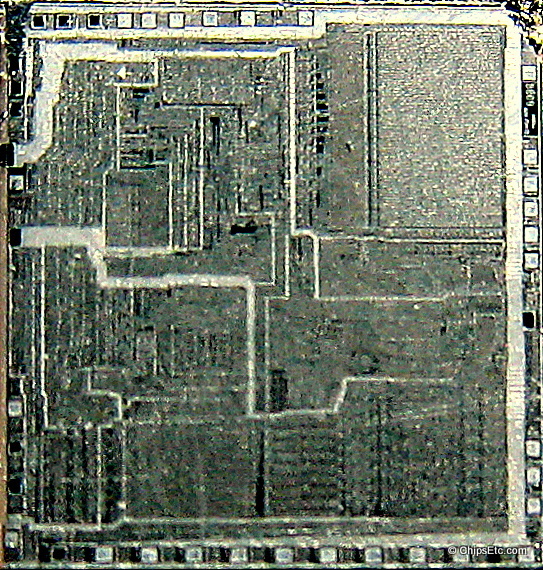 8086 compatible processors would later be manufactured by AMD, NEC, Texas Instruments, Fujitsu, Harris / Intersil, OKI, Siemens, Mitsubishi and others. 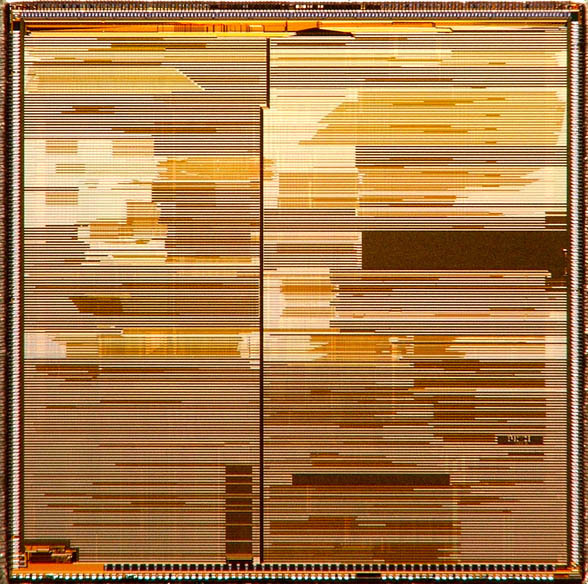 Low-power 8086 compatible processors are still used today in many embedded systems. Metal tie tack has a blue enamel back ground with a silver colored Intel "dropped e" logo. Measures 7/16" wide x 1/2" tall. 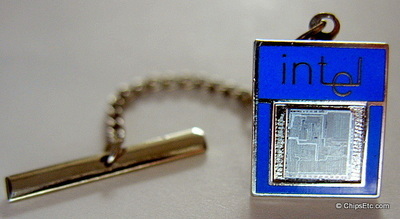 Lapel pin features an Intel 386SL processor. ​The 32-bit 386SL was Intel's low-power version of the 386 processor designed for laptop computers. It had 875,000 transistors and was manufactured using Intel's 1.0 micron process. The clock speed of this CPU was originally introduced at 20 MHz, with a 25 MHz version offered later. 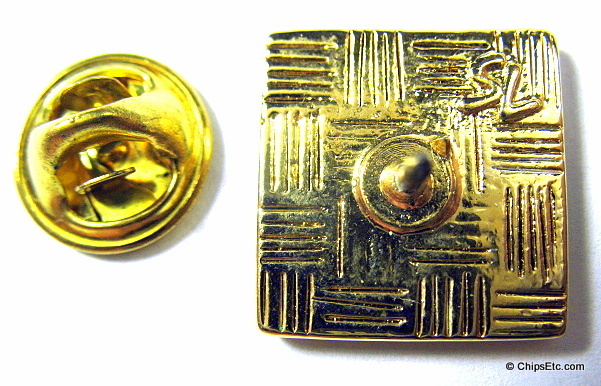 ​Lapel pin has "SL" embossed on the back. 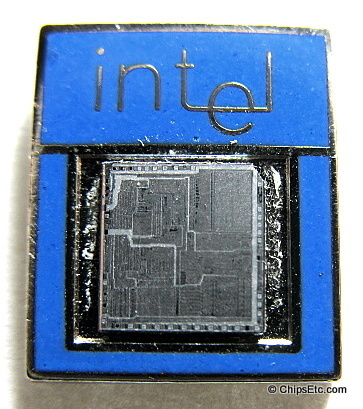 Back of the Intel 386 SL CPU Lapel pin. 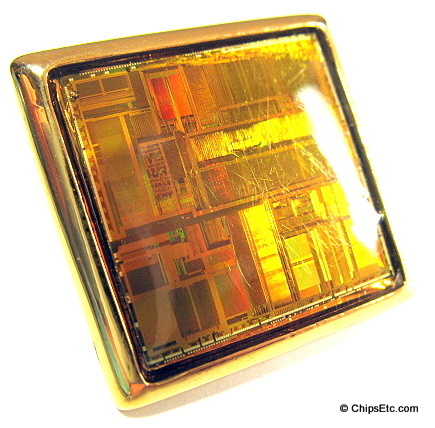 Lapel pin features the original Intel 486 DX processor chip, also know as the Intel i486. The Intel 486 was introduced with a clock speed of 20 MHz. Later versions would be offered at speeds of 25, 33 & 50 MHz. 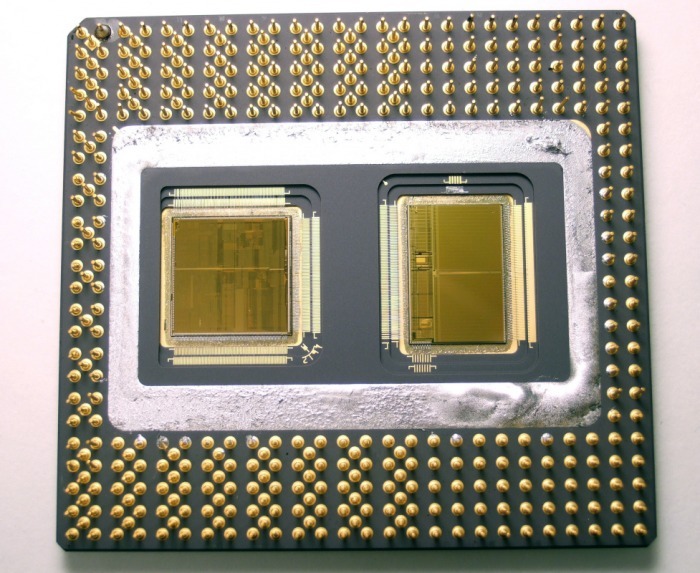 Intel would manufacture the original 486 CPU using their 1 µm process, with later versions manufactured at 0.6 µm, reducing the 486's die size. Other semiconductor makers including AMD, Cyrix, SGS Thompson / STMicroelectronics, IBM, UMC & Texas Instruments would produced 486 compatible processors. Intel would continue to manufacture the 486 processor up until September 2007 for use in embedded computing systems. 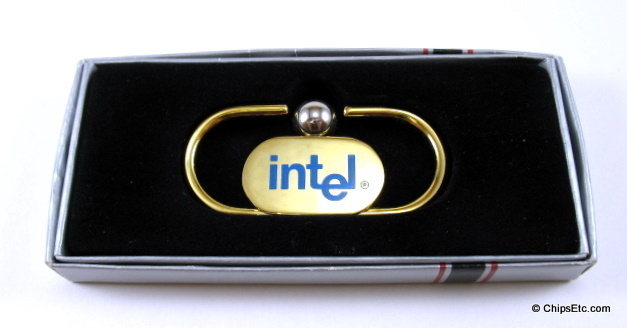 Intel 486 Lapel Pin in black velvet gift box. Gift cards reads: "The Intel 486 microprocessor packs 1.2 million transistors onto a .414" x .649" die, in addition to an enhanced CPU core, the i486 DX CPU integrates a floating-point unit, on-chip cache memory, and a memory management unit. 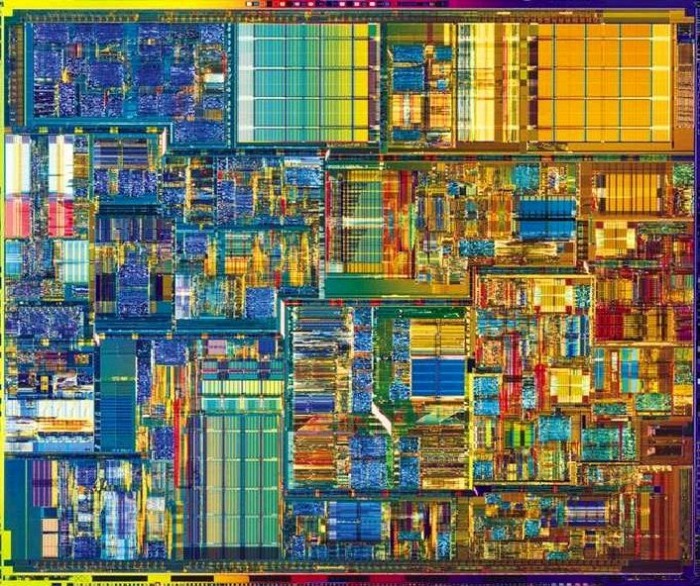 Systems based on the i486 DX CPU can deliver more than 40 million instructions per second." 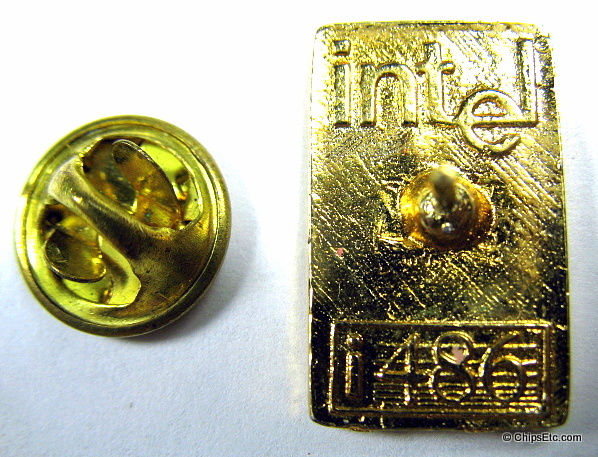 ​Lapel pin featuring an actual Intel 486 DX2 processor chip, also known as the Intel i486DX2. The 486 DX2 was introduced in 1992 with a clock-doubled speed of 40 MHz. It was the first chip to use clock doubling circuitry. It's speed would later increase to 50 & 66 MHz. 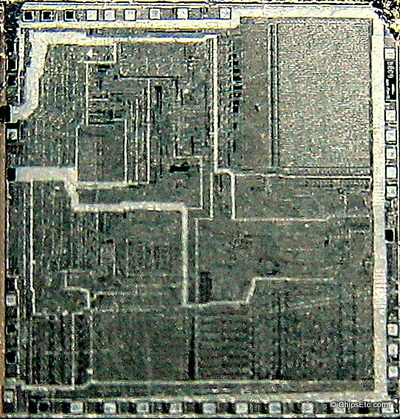 The 486DX2 was manufactured using Intel's 0.8 micron process and had 1.2 million transistors.The die size of the 486 DX2 was considerably smaller than it's predecessor, the 486 DX. During the early to mid 1990s, the 486DX2/66 CPU was a popular choice for video game players running DOS based games on their PC's. 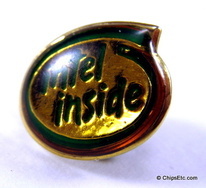 Intel metal lapel pin is enamel coated and features the Intel logo in green. 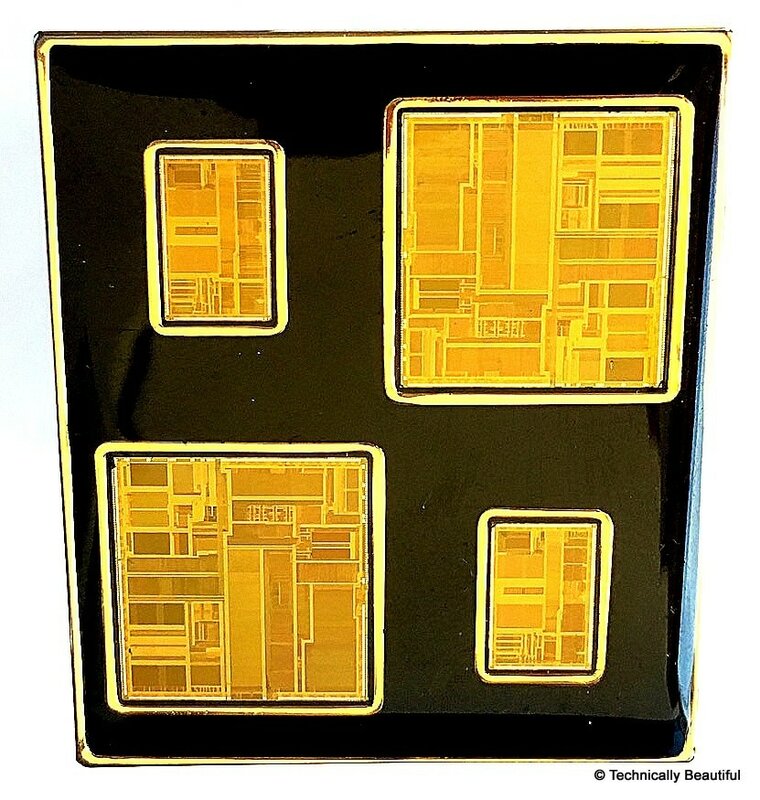 Broach Pin made by Silicon Valley Ware Inc. for Intel features actual 486 & Pentium processor chips encased in black enamel and gold toned metal frame. 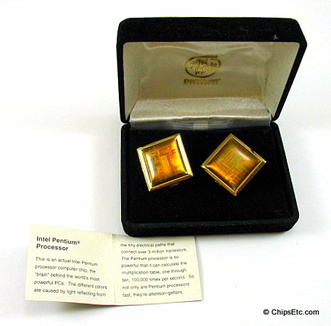 Brand new set in original velvet jewel box, Intel Pentium Processor cuff links with real Pentium computer chips encased in enamel set in gold plated metal. 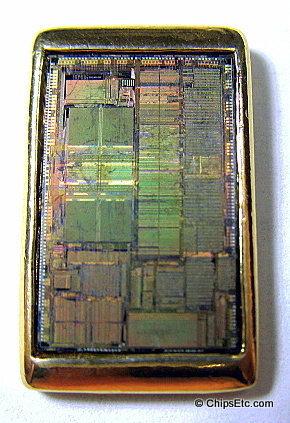 This is an actual Intel Pentium processor computer chip, the "brain" behind the world's most powerful PC's. The different colors are caused by light reflecting from the tiny electrical paths that connect over 3 million transistors. The Pentium processor is so powerful that it can calculate the multiplication table, one thru ten, 100,000 times per second. So not only are Pentium processors fast, they're attention-getters. 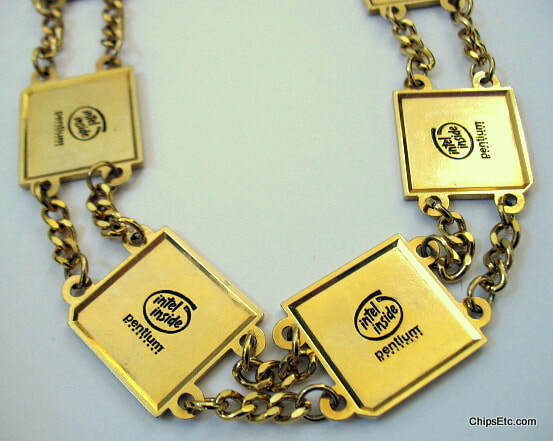 ​This is a rare gold-plated bracelet from Intel that features three actual Intel Pentium processor chips, one on each link. These bracelets and other Intel jewelry items were produce for Intel in 1994 by a local promotional product designer and manufacturer named Silicon Valley Ware, inc. of Mountain View CA. 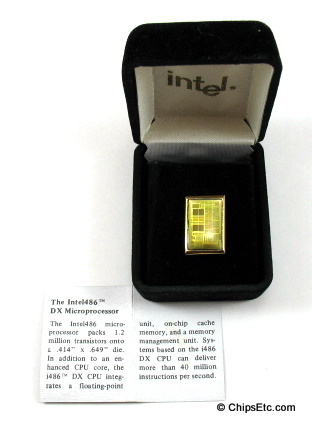 Silicon Valley Ware had also produced jewelry items for Intel in the past using their i486 processor chips to create gifts to give to employees and business contacts. On the back of each bracelet link is the Intel logo embossed into the piece. One item is a 4-link bracelet, the other is the 3-link bracelet version (shown). 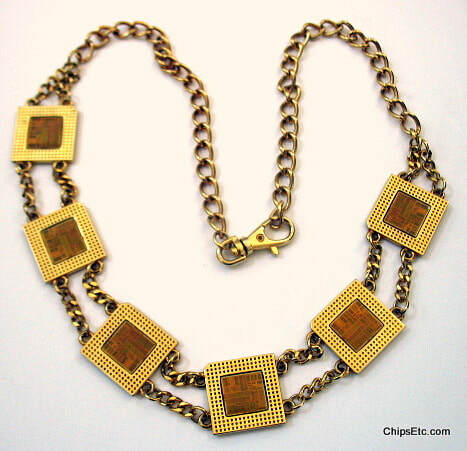 ​This is a rare gold-tone necklace from Intel that features 6 actual Intel Pentium processor chip dies each mounted in metal frames that resemble the actual finished Pentium chips. 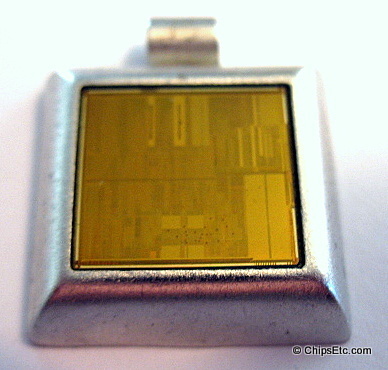 On the back of each chip is the Intel Inside / Pentium logo embossed into the piece. 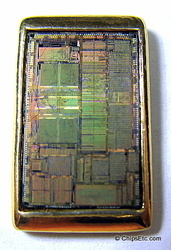 Actual Intel "P5" Pentium Processor Chip embedded in metal gold-toned setting. Has the Intel logo in back of pin. 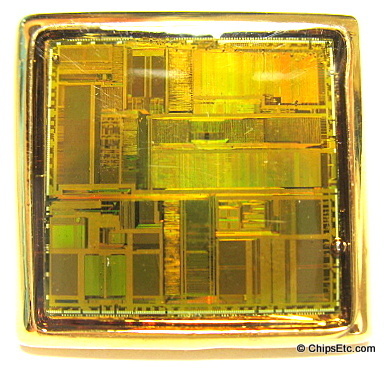 Chip die is marked "Intel c.1992 P5"
​Made by SIlicon Valley Ware, Inc. for Intel. 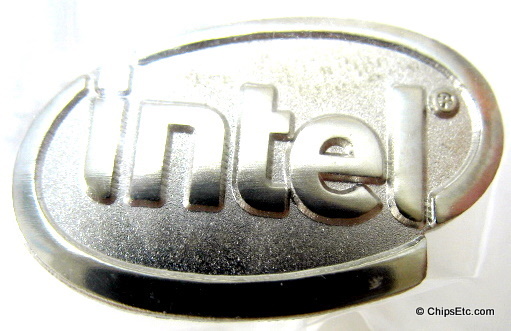 Intel metal lapel pin is enamel coated and features the Intel logo in red. 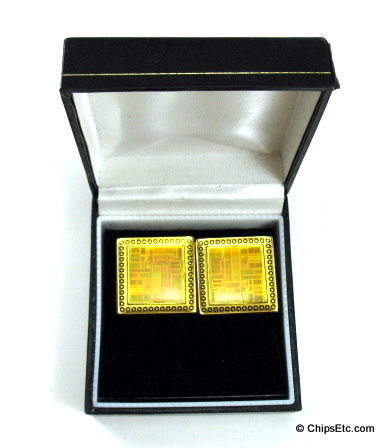 This is a early style design of Intel large Die Pentium Processor chip cuff links. Comes in velvet gift box. Built in 1988, the D2 facility was located on Intel’s property at its Santa Clara headquarters and contains more than 100,000-square feet of clean-room space. Intel was completing what it called the Phase 3 of it's Santa Clara, Calif. site expansion in preparation for production of the Pentium P6 in 1995. D2 Phase 3 then became home to Intel's first .25-micron MPUs, including the P6 and P7. In 2009 Intel Announced that wafer production operations would finally end at the D2 facility. The Pentium Pro is a sixth-generation x86 based Microprocessor developed and manufactured by Intel introduced in November 1995. It introduced the P6 Micro-architecture (sometime referred as i686) and was originally intended to replace the original Pentium in a full range of applications. While the Pentium and Pentium MMX had 3.1 and 4.5 million transistor, respectively, the Pentium Pro contained 5.5 million transistors. Later, it was reduced to a more narrow role as a server and high-end desktop chip and was used in supercomputers like Sandia National Lab's "ASCI Red". The Pentium Pro had a completely new Micro-architecture than it's original Pentium predecessor. The Pentium Pro (P6) featured many advanced concepts not found in the Pentium. 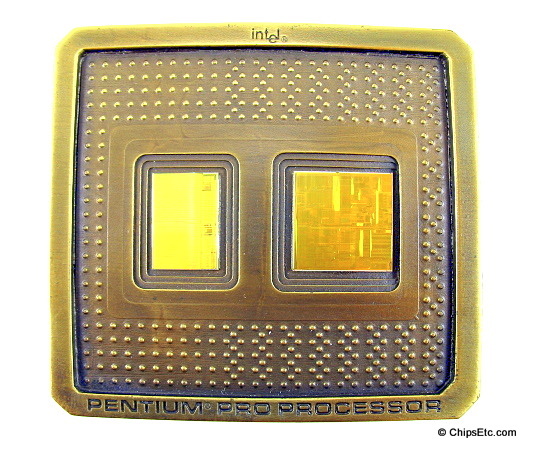 Offered in 133 MHz to 200 MHz speeds, the Pentium Pro processor was manufactured using Intel's BiCMOS process technology at 0.35µm to 0.60µm (CPU) / 0.35µm to 0.50µm (Memory). 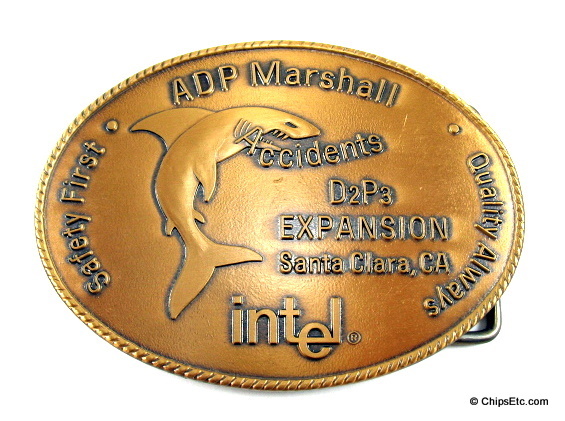 This wearable solid Bronze Belt Buckle was awarded to select Intel employees who were directly involved in the Pentium Pro Processor Technology Development. It contains actual chip examples of both the Core CPU and the Memory Chip which together, made up the Pentium Pro Microprocessor. This limited edition item is engraved on the back with Serial # 712 of 2500 made. 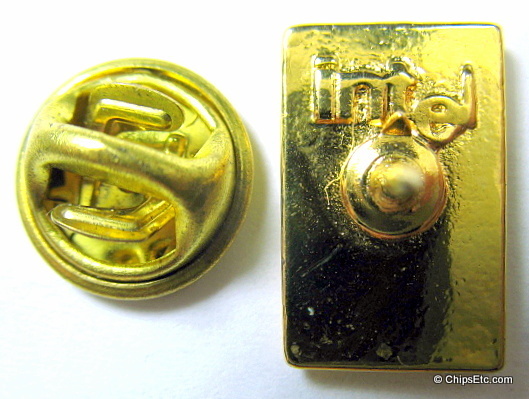 Brass Intel "dropped-e" logo tie tack features the underside view of a Pentium processor package. Marked "SOFREC Paris" on the back. 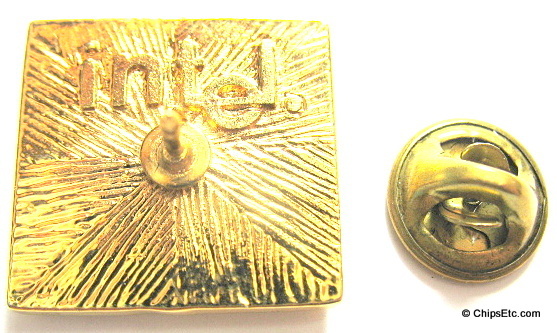 Intel "dropped-e" logo tie tack is made of brass. 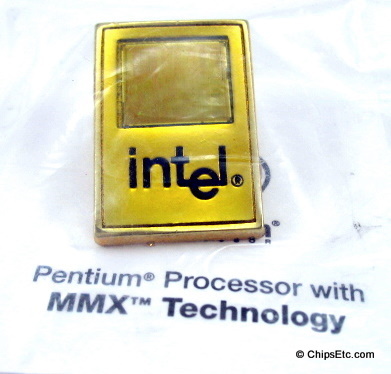 Enamel coated Intel Pentium Processor Lapel Pin for promoting the MMX chip. Comes with information card describing the Pentium Processor with MMX. 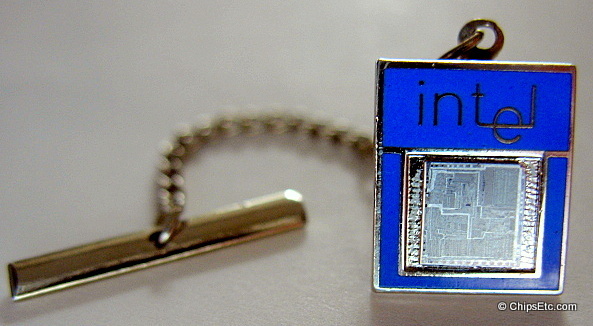 Metal and Enamel Pin features an actual Intel Pentium Processor chip. New, sealed with information card. 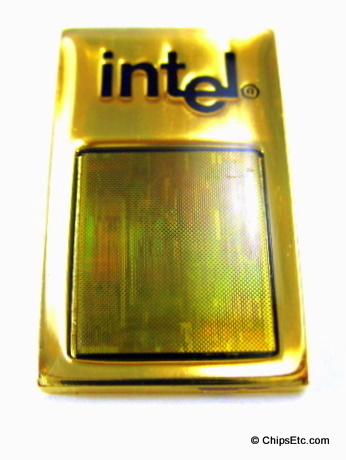 Large Metal and Enamel Intel lapel pin features a holographic image of an Intel Pentium processor chip. 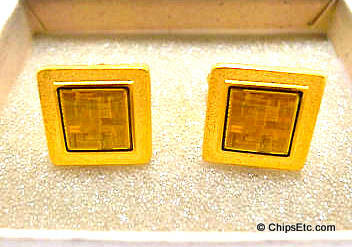 This gold plated cuff link set was part of Intel's "Sands to Circuits" collection of wearable tech jewelry. It features embedded Pentium Processor chips. 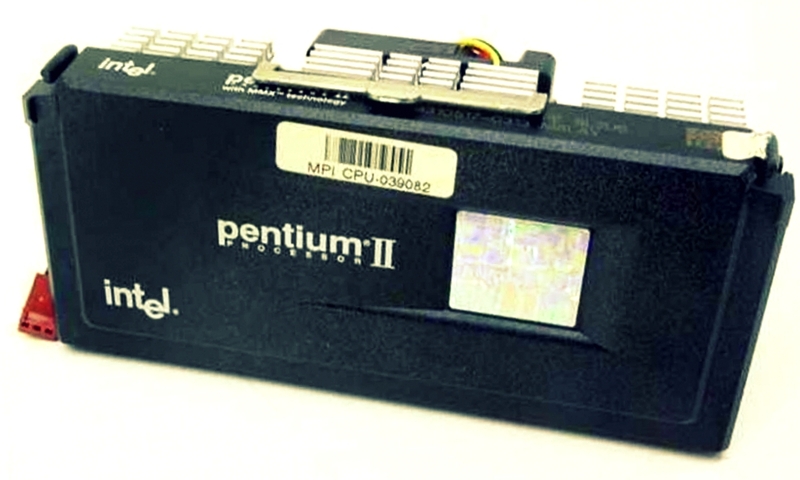 The "Deschutes" core Pentium II (80523) debuted at 333 MHz in January 1998. Later in 1998, Pentium II's running at 266, 300, 350, 400, and 450 MHz would also be released. 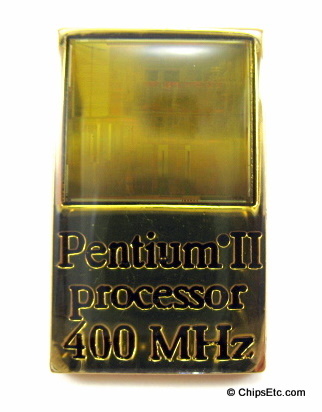 The Pentium II 400MHz was produced using Intel's 0.25 um manufacturing technology and had 7.5 million transistors. 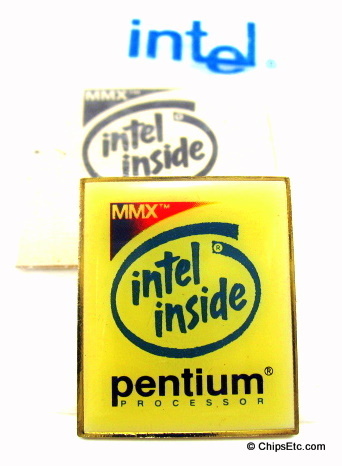 The Intel Pentium II processor was Intel's first processor to be offered in Single-Edge Contact Cartridge (SECC) form factor packaging, known as Slot 1. AMD would shortly thereafter offer their own version of the SECC packaging for their Athlon processor, called Slot A. The two versions of SECC form factors were mechanically identical, but were not electrically compatible, so AMD had to key their Athlon processor cartridge to be inserted 180 degrees from that of Intel's Pentium II so the two processor couldn't be accidentally interchanged. 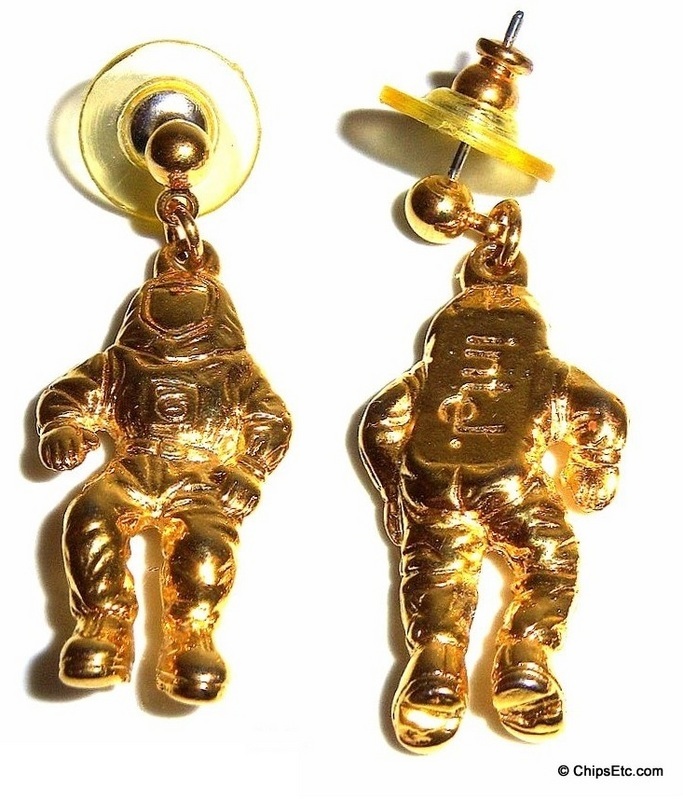 This is a set of gold plated earrings that feature the Intel Bunny People character with Intel logo on the back. 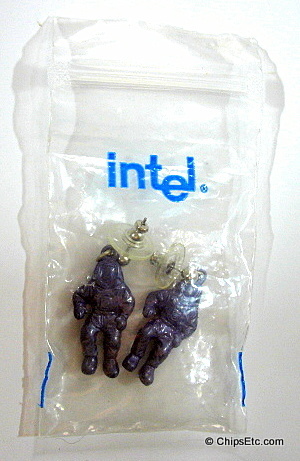 This is a set of metal earrings (color purple) that feature the Intel Bunny People character with Intel logo on the back. 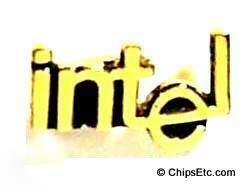 ​New in original Intel logo package. Metal and Enamel pin features the Intel BunnyPerson character promoting the Pentium II MMX Processor. Earring set is from the Intel "Sand to Circuits" jewelry collection. 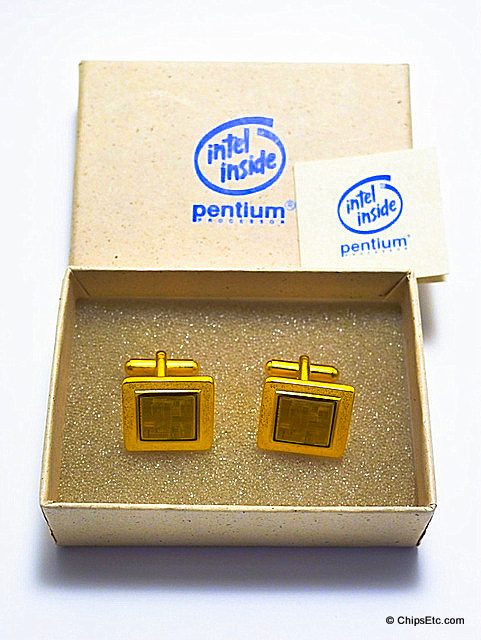 Fish hook pierced earrings are gold plated and have an actual Pentium II processor mounted in them with Intel logo on the back. 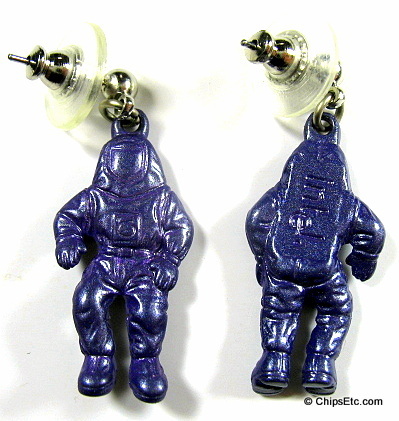 Earrings set is also from the Intel "Sand to Circuits" tech jewelery collection. 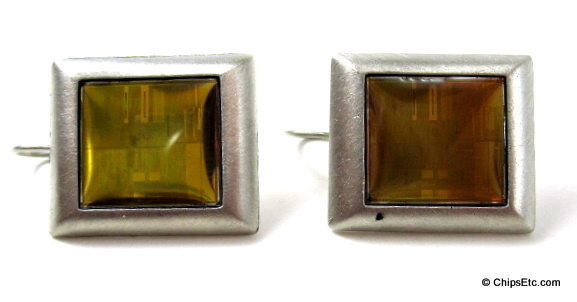 Fish hook pierced earrings are pewter and have an actual Pentium II processor on them with Intel logo on back. Pendant necklace is from the Intel "Sand to Circuits" wearable tech jewelry collection. 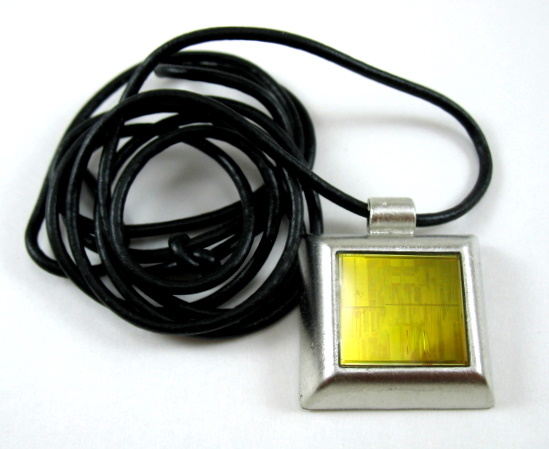 Features a sleek black cord necklace an actual Pentium II processor on front with Intel logo on back. Comes in black gift enclosure with Pentium II logo in purple. The Intel Pentium 4 was Introduced in 2000 with a processing speed of 1.3MHz. The Pentium 4 processor featured an entirely new architecture, Intel's first all-new design since 1995. 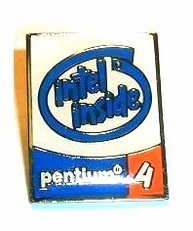 Metal and Enamel Lapel pin featuring the Intel Pentium 4 logo. New in sealed package with cardboard Pentium 4 logo card insert. 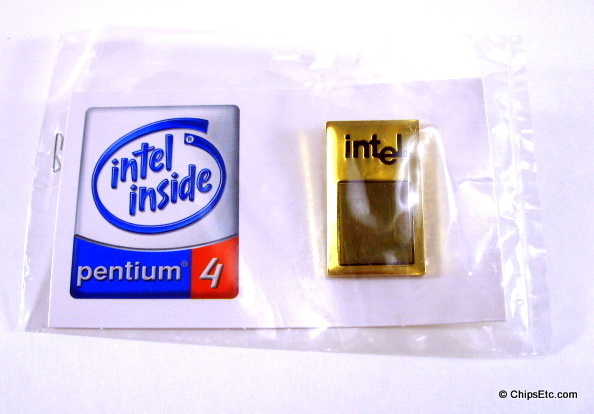 Metal coated enamel pin features the Intel Pentium 4 Logo. Solid polished metal money clip features the famous Intel "dropped-e" logo. 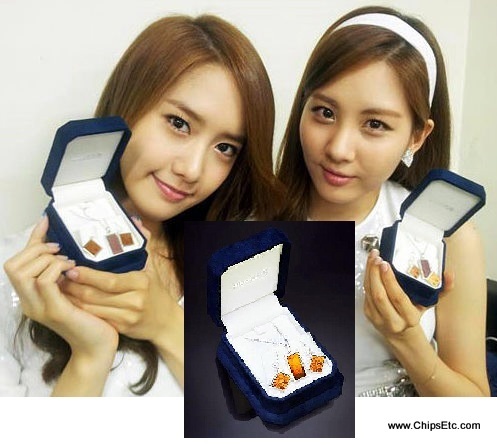 In original velvet gift box. 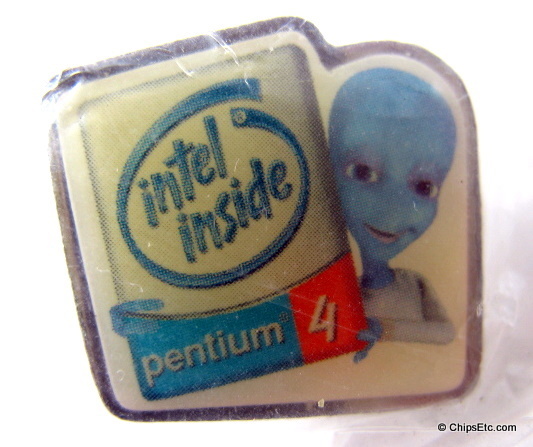 Metal and Enamel Lapel pin promoting the Intel space aliens ad campaign and the Pentium 4 Processor. Polished steel Intel logo Tie Tack Pin showcasing Intel's new "Leap ahead" logo. On Jan. 3, 2006 Intel unveiled a new brand identity which changed its long standing "dropped e" logo with a new logo. 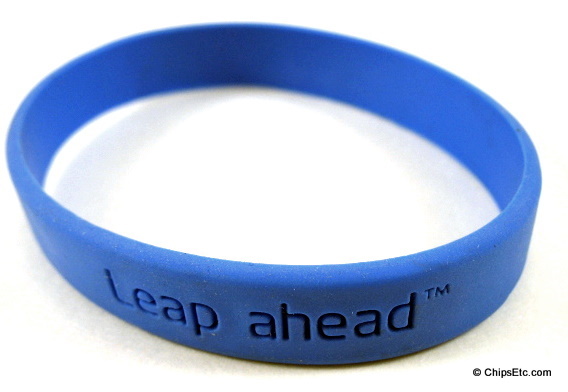 "Leap ahead" became the new company tag-line. 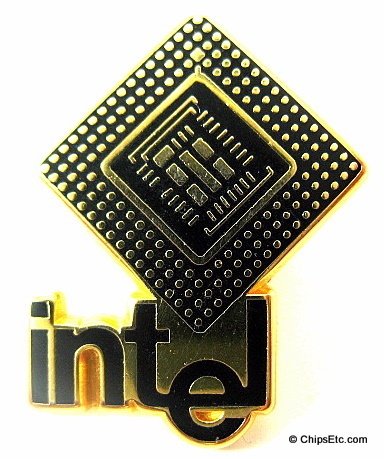 The new brand identity involves changes to the widely recognized Intel Inside logo that was created in 1991, and the original Intel “dropped-e” logo, which was created by Silicon Valley pioneers Robert Noyce and Gordon Moore in 1968 as they were forming their new “integrated electronics” company. Intel’s new logo combines the essence of both of these powerful symbols, building on Intel’s rich heritage, yet also signaling the new direction the company is headed today. It also includes a new tag-line: “Intel. Leap ahead”. This tag-line is Intel’s unique brand promise and is designed to communicate what drives Intel as a company, and what Intel makes possible. Blue Silicone "cause" style wrist band.